Joey Curletta knew one thing for sure as he approached the start of this season, his seventh in professional baseball and second with the Seattle Mariners organization. "I had more in the tank," said the Arkansas Travelers first baseman. He's proven that over the course of this campaign, one in which the 24-year-old has taken the Texas League lead in almost every major hitting category while emerging as a favorite for Player of the Year. A sixth-round pick of the Dodgers in 2012, Curletta isn't among the Mariners' top 30 prospects, but he's no doubt turning some heads. 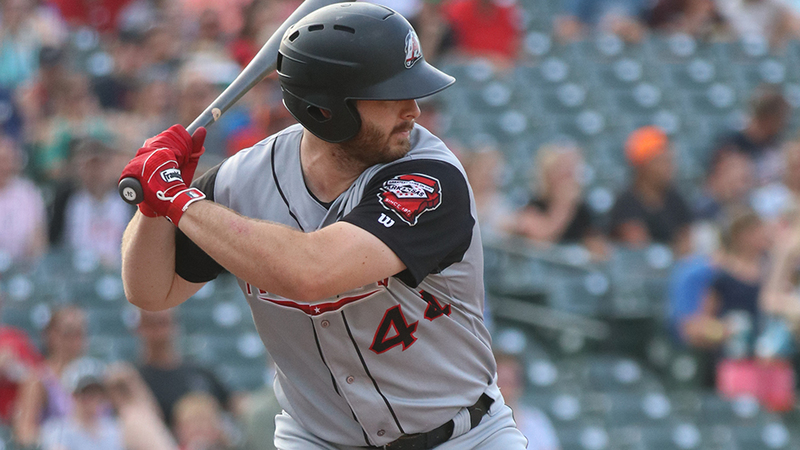 With just over a week left in the regular season, Curletta leads the Texas League in RBIs (89), on-base percentage (.401), OPS (.920), total bases (216) and walks (76) and is tied for the league lead with 23 home runs while hitting .300. The breakout has come after he batted .256/.343/.441 with 15 home runs at Class A Advanced Modesto last year, and two years after he struggled in his first Double-A stint, hitting .206 with four home runs and 14 RBIs in 29 games with Tulsa. It's a stark contrast from what he put forth in years past. "I think scouting reports would have said this is something I could have done, but they would have said that I just haven't done them," he said. "So yeah, I probably have changed people's opinions. But that's not what I'm concerned with. "It feels good to prove it to yourself more than anything." The breakout began back in the offseason, he said, when he worked out with Phillies infielder Scott Kingery. Curletta and Kingery have known each other since Little League -- both went to Mountain Pointe High School in Phoenix, Arizona -- and regularly work out during down times. Curletta said this past year, Kingery provided tips that he had picked up from working with Yankees slugger Aaron Judge. The message: let the natural strength of his 6-foot-4, 245-pound frame take over. "He told me what [Kingery and Judge] did when they were together, and I just grabbed a few of those things," Curletta said. "And I tired the best I could to implement it." The results were evident from the start of the season, no matter the situation. Curletta has hit over. 290 in four of five months this season, he's hit .301 against left-handers and .300 against right-handers, and he's even been successful at home in Dickey-Stephens Park, considered one of the toughest for hitters in Double-A. He's hitting .291 with 11 homers and 49 RBIs at home. "I haven't tried to do anything here that I haven't in other parks, and I think hat's why it's been good," he said. Curletta's season has been so consistent that he said recently there wasn't a moment in which he was struck by how impressive his statistics were. It's been a steady rhythm, and he's simply working to keep it going. "It's kind of weird," he said. "Everyone has the moments where you hit really well, or you don't hit well. It kind of goes back and forth. It's a season-long thing. It's not like I've got it all figured out. There's always adjustments to be made." Fully loaded: The Corpus Christi Hooks are getting two big pieces back in time for a playoff push. Third baseman Randy Cesar was activated from the disabled list on Aug. 18, and right-hander Forrest Whitley was activated Aug. 14. Cesar broke the Texas League record by hitting safely in 42 consecutive games earlier this season, while Whitley is the Astros' No. 1 prospect and has a 3.76 ERA with 34 strikeouts in 26 1/3 innings over eight starts this year. Cesar is hitting .308 with 10 home runs and 59 RBIs. The Hooks, who won the South Division first-half title, entered Wednesday's game with a 3 1/2-game lead over Frisco in the second half. Moving on: A front-runner for Texas League Pitcher of the Year graduated to Triple-A earlier this month. Logan Allen, a left-hander in the Padres system, was promoted from Double-A San Antonio to El Paso on Aug. 10. Allen's 2.75 ERA leads the Texas League, while his 10 wins are tied for the lead and his 125 strikeouts are second. Pulling away: With less than two weeks to go in the regular season, Northwest Arkansas infielder Jecksson Flores is trying to keep his hold on the Texas League batting title. Flores entered Wednesday's games hitting .318, six points ahead of Midland's Eli White. Flores has done it by being his best of late. He's hitting .342 in August with five doubles and two triples. Five times this month Flores, in his first Double-A season, has had multi-hit games, including four hits on Aug. 9 against Midland. Troy Schulte is a contributor to MiLB.com. This story was not subject to the approval of the National Association of Professional Baseball Leagues or its clubs.